Ocelot Anatomy, habitat, distribution, feeding, reproduction, evolution, social structure, conservation. 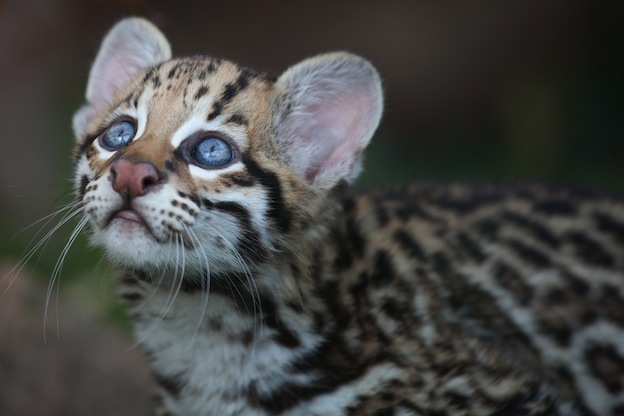 Ocelot images, videos and top facts. The Ocelot is often referred to as the Dwarf Leopard. This is a gorgeous animal that many people are very impressed by the look of. This particular feline looks very much like the domestic cat in size. However, the fur of it looks like that of the Leopard. The coloring ranges from tan to reddish. They have dark lines on the sides of the face and white on the back of the ears. The Ocelot weighs from 15 to 34 pounds. They have a very long tail with black bands around it. They have small heads and very small teeth compared to other cats. The ears are round and the paws are quite large when you consider the proportions of the rest of the body. There are many locations out there where the Ocelot is found. They include Brazil, Argentina, Venezuela, and Costa Rica. Some of them are in remote parts of Mexico and the Caribbean. There have been reports of low numbers in the State of Texas too. Many believe those are from Mexico and they have migrated to new territories. The Ocelot is a very aggressive type of feline. They will fight aggressively for territory. These battles will often result in death, especially at times when food sources in the natural habitat becomes hard to find. They will heavily mark their territory with urine. The only time they will really tolerate each other is during the mating season. However, the males will be more likely to fight with each other then so that they get to mate. They are nocturnal animals with a very good sense of vision to help them move around freely in the dark. There is a variety of food sources for the Ocelot. They include small deer, frogs, rodents, birds, turtles and fish. They are able to swim and they are able to climb trees. Such versatility gives them more access to food sources than most other animals that are restricted to finding it only on land. Mating for the Ocelot can occur at any time of the year. The females go through a 7 to 10 day period of estrus. Once the pair has mated they will part ways. It will be about 80-82 days later when the female has her young arriving in a cave or den that she has prepared for them. Usually she will have only one kitten but there are times when two are born and very rarely four of them. The young weigh about 9 oz at birth. They won’t be able to open their eyes until they are a couple of weeks old. Otherwise she will only mate every other year. 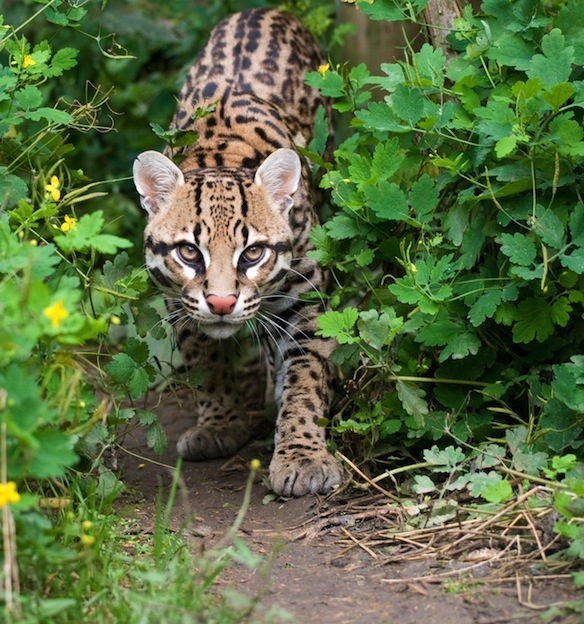 Due to the lovely fur on the Ocelot, they have been heavily hunted in the past. The fact that very few people wear furs today has helped to prevent them from going extinct. They were considered Vulnerable from 1982 until 1990. Due to those aggressive efforts to protect them though they are now out of that position and not considered to be in threat of extinction. Due to the fact that the Ocelot is very much like a domestic cat and very pretty, they are often sold as exotic pets. People will spend thousands of dollars to buy them. Many celebrities have been identified as owning them. Those that remain in the wild may experience problems with humans depleting their habitat and that will make it harder for them to survive.